Keeping up with kitchen trends isn’t quite like peeking over your neighbor’s fence, but it’s close. 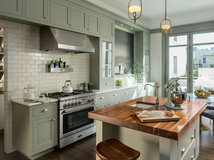 Flash in the pan or not, trends can give us cues for increasing a home’s short-term resale value or simply inspire us for an upcoming renovation. We caught up with designers Jane Lockhart and Gail Drury for a preview on how homeowners will design their kitchens in 2017. They’re confident these 10 trends will rule the cooking sphere this year. 1. Colorful cabinetry. 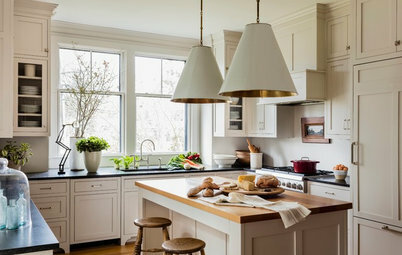 White kitchens aren’t going anywhere, according to both designers and Houzz research. 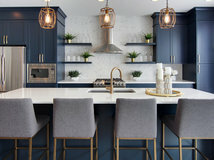 But designer Jane Lockhart admits that we’ll start to see more color in cabinetry, including navy, black, deep charcoals and cream colors. “Navy and dark colors will be on lower cabinets and islands to contrast with lighter neutrals on uppers,” she says. 2. Personalization. Homeowners won’t shy away from incorporating colors, patterns and decor they love into their kitchens in 2017. 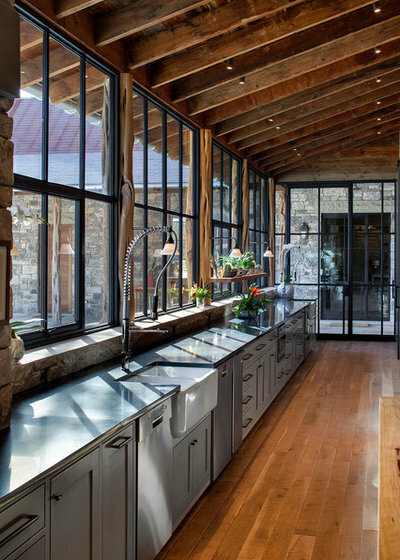 As a result, Lockhart anticipates more personalized kitchen spaces. 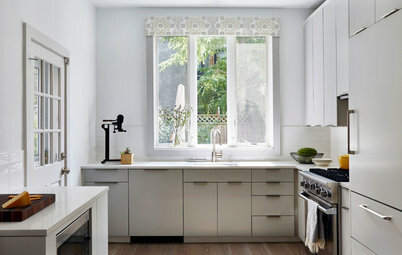 “While white is still popular, it’s not personalized, so we’ll see more individualized kitchens through color and materials,” she says. Colors will range from pink and black to jewel tones, while materials will emphasize geometry and texture. 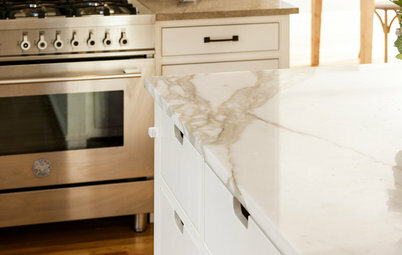 You can also expect to see decor items such as area rugs and runners to add even more personalization to a kitchen. Caitlin & Caitlin Design Co.
3. Jewel tones. 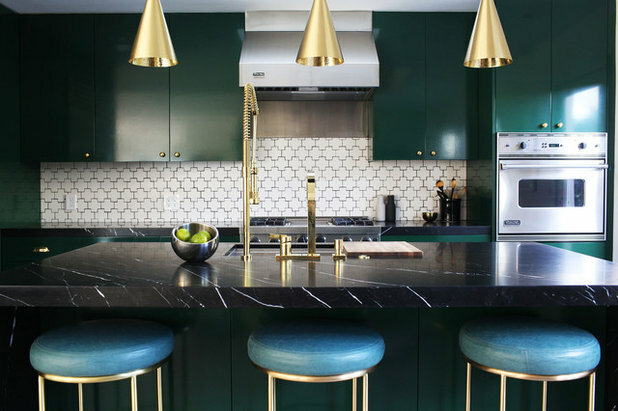 Chic and sophisticated tones such as ruby reds, golds, turquoises, emeralds and sapphires will appear throughout backsplashes, fabrics, hardware and more. 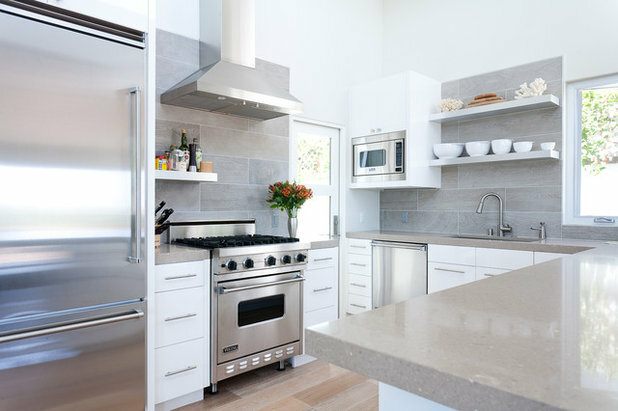 Don’t be surprised to see range hoods donning these color tones too. “They will be made to look like jewelry in interesting shapes,” Lockhart says. 4. Flat-panel cabinet doors. 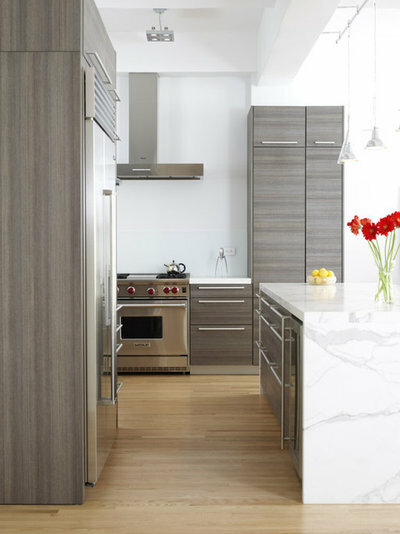 Shaker style is currently king of the cabinet door, but watch out for flat-panel designs. Both Lockhart and Drury think these simple, detail-free designs will rise in popularity. “We’re going to see more slab or flat-panel doors,” Lockhart says. “Shaker-style will remain popular but with very clean lines.” Doors will instead rely on texture, such as rift cut oak, for detail and visual intrigue. Not a fan of modern door styles? Drury says there’s still a way for traditionalists to make the most of the details. “It will be about the small nuances in the door design details, like the width of the stiles and rails, thickness of the panels, and routing details,” she says. 5. Tactile textures. It’s all about the tangibles when it comes to kitchen surfaces. Design elements will play with our sense of touch by offering shiny, textured and roughly painted surfaces to admire. Drury predicts homeowners will mix and match these textures throughout their spaces. 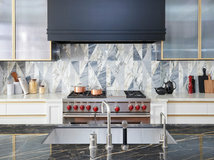 “It will be different textures, such as tile with a wavy relief to it next to a honed countertop and cabinets with a high-gloss polish sheen,” she says. 6. Pops of pink. Kitchens were no stranger to pink color tones last year (see: rose gold accessories), and they’ll only get better acquainted this year. You won’t find too many spaces with bubblegum pink accents, though. Lockhart believes 2017’s pink will be much more muted. “Dusty pink is seen in small appliances now and will look beautiful with gold fixtures,” Lockhart says. She expects dusty pinks to pop up in window treatments and dish towels, as well as appliances. 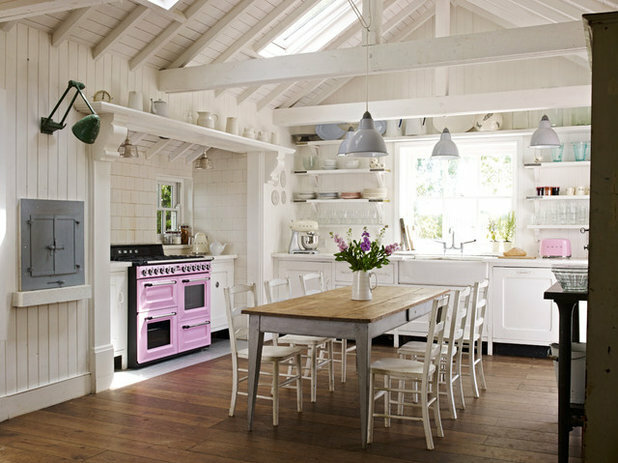 “Full-sized retro pink appliances are available now but in a brighter pink shade,” she says. You can work pink into other design elements such as light fixtures and florals too. 7. Smaller, smarter appliances. Hyper-efficient meal prep is on the way, and there’s an app for that, according to Drury. Homeowners will use their smartphones to program their appliances and monitor the meals they’re cooking. “We will be able to turn our appliances on and off from the office and adjust temperature settings,” she says. 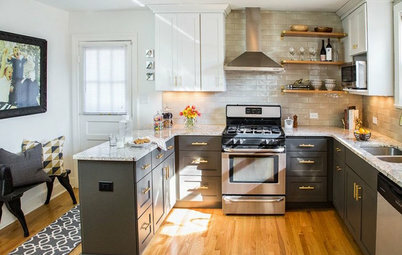 Homeowners will also turn to smaller appliances such as wall-mounted mini refrigerators and built-in steam ovens to cut down on meal prep and cleanup time. “Single units like induction elements will become more popular as people use their large stoves and ovens less to accommodate more specific, personalized meal preparation,” Lockhart says. 8. Geometry. If there’s one thing kitchens will sport more of this year than they did last year, it’s geometry. 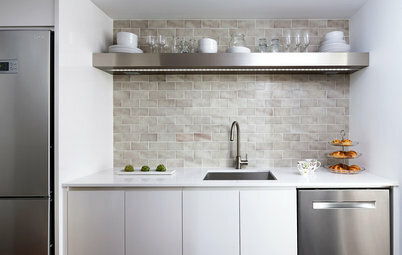 “We’ll see more angular shapes in backsplash tiles, for instance,” Lockhart says. 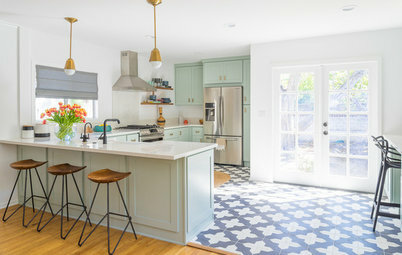 “Larger-format tiles will prevail in more structured shapes like chevron.” Longer and wider subway tiles (such as 4-by-8-inch or 4-by-12-inch tiles) will also rise in popularity. 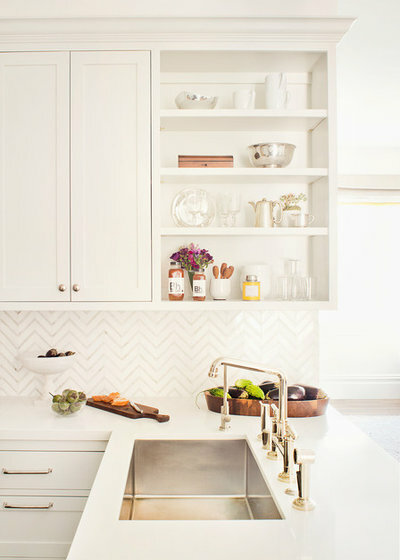 Tile patterns such as chevron, herringbone and hexagons can provide contrast and dimension in kitchens with a relatively clean and minimal color palette. 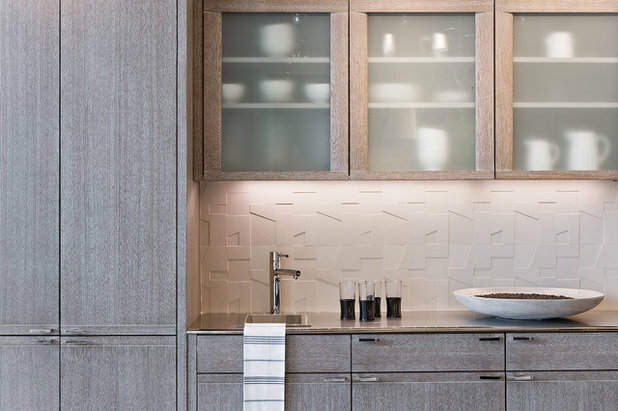 This transitional kitchen’s angular backsplash brings visual relief to the space’s crisp, white design. 10. Feature windows. Windows can do a lot more than let the light in. They also make exceptional accent pieces. Fortunately, homeowners have caught on and will allow their windows to steal some of the spotlight this year. 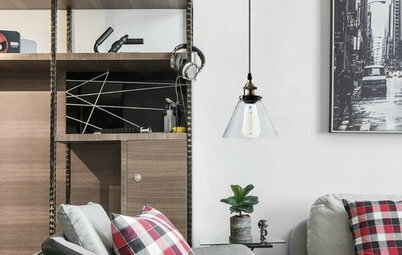 “No longer hidden, windows are making a bold statement in interesting shapes and dark and black frames,” Lockhart says. 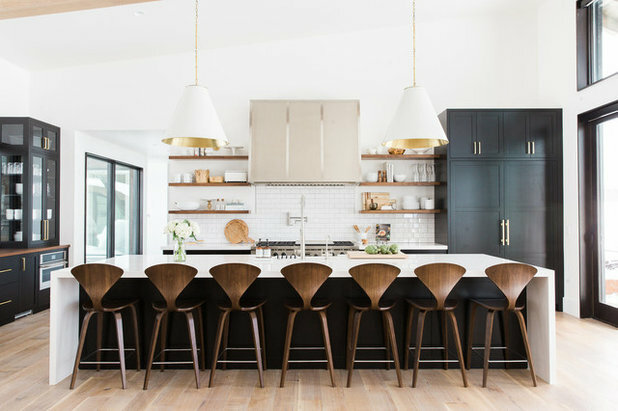 “They’re being hung higher and longer as they become more of a feature to contrast with drapes.” A dark frame can create dramatic effect in a light and airy kitchen or accentuate medium-toned woods and wall colors. Painting my kitchen cabinets Benjamin Moore White Dove. Should I add a light glaze in the detail of the cabinet or leave it without a glaze. I like the look of the glaze in the corners but no all over the cabinet.. My house is traditional so I thought a small glaze in the detail of the cabinet would make it fit in more with the house style but I don't want to date it in case I need to sell my home within a few years. It"s November 2017. Any advise would be appreciated. Need to make decision ASAP as in the middle of the project. overglaze is viewed as a bit out of date now, i'd give it a miss. gkloda: if you're picking your colors based on what potential buyers will think, then do what is more appealing to the most people, i.e, skip the glaze altogether. If you're painting it for your own enjoyment, then do what you want, not what is "out of date."